I am in the process of creating & executing all the paper products and decorations for an upcoming party. I can't give too many details until after it, since it is a surprise and the customer follows me! Quick everyone think it may be them!!! It's approaching quickly so invitations are created, sent out, and RSVP's have started to come back! Next up is the decorations... Below are steps when planning a party! First thing is first.. decide if your funds allow for you to spend extra for a party. If you have been saving or can splurge on this event, make a budget for how much you would like to spend. This depends on location, drinks, food, decorations, and optional thank you gifts. Think about an ideal place you would like to throw your shindig! Depending on what kind of party/event it is depends where you may be looking. Lots of places book 2-6 month's in advanced, so make sure you keep that in mind. Once you find a location that fits into your budget pick a date that fits which the place and your schedule! This is one of the hardest things to do. You don't want to hurt anyone's feelings by forgetting them or not inviting them. 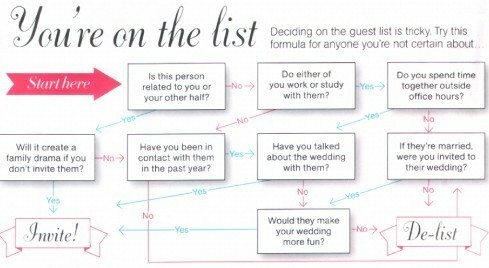 The above chart is a little more useful with a bigger event such as a wedding.. but you get the picture! Make sure to keep your budget it check and don't invite people emotionally! Create invitations or use social media to invite your guests! Make sure to include a RSVP date for regrets, especially if you are holding it at a location that requires head counts. Usually about 2 weeks before the party, if you are holding it at a location; you will pick the final menu. This depends on your event, for example: BRIDAL SHOWER you may want to do sit down lunches or 25th BIRTHDAY PARTY may chose to do appetizers and picky foods! Also, you need to decide bar limits if you chose to do alcohol. One thing I am doing is bar tickets good for one or two drinks on me in order to control the bar tab. If you chose a theme you may want to purchase your decorations starting right away so you don't blow your whole budget at once! For me I'm getting artsy and making a lot of mine. You also need to think if you are making/bringing your own cake-desserts. This are important part of birthday parties. Don't forget little details such as candles, table clothes, centerpieces! Most importantly, HAVE FUN at the party. You planned the whole thing, down to every detail so you may be stressed that day. Take even 5 minutes to just step back and take it all in! You did it. Everyone's having fun, so now YOU need to also!